Washington Gateway Main Street is excited to bring our Artistic Bike Racks Project to life late in summer 2018. In partnership with Artists for Humanity and Boston Transportation Department, WGMS channeled the historic design of South End row house stoop railings to create unique bicycle storage racks to live throughout the district. We're so excited for our new public art initiative designed with one focus: to bring more art to South End streets and parks. Each year, we will focus on three signature installations based on community feedback. Thank you to everyone who joined us for our kick-off, ARTSE: The South End Party for Art, Music + Good Times on May 22! Our ongoing partnership with Project Place's facilities maintenance social enterprise, Clean Corners...Bright Hopes, works to clean both sides of Washington Street from Herald Street to Melnea Cass Boulevard (the length of the Main Streets district). 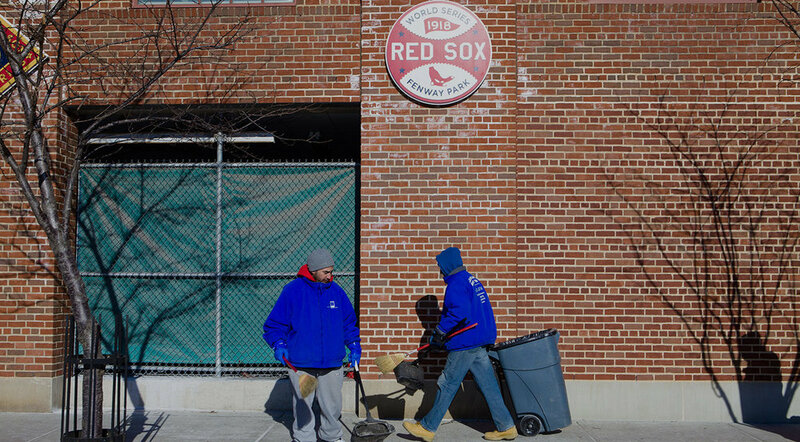 Workers pick up and bag trash along sidewalks and gutters; remove posters from light poles; and clean the city's "Big Belly" trash containers twice per week. In an ongoing effort to make our district's parks more safe, active and beautiful, Washington Gateway Main Street and Blackstone Franklin Sq. Neighborhood Assoc. recently partnered to bring artistic light installations to Blackstone and Franklin Sq. parks. In Blackstone Sq. lights strung from the light poles around the fountain illuminate the fountain and center of the square. For Franklin Square two artists, Michael and Claudia Moss installed "Nimbus", 26 orbs suspended over the fountain that illuminate the fountain in various colors each night. Thank you to the Blackstone Franklin Sq. Neighborhood Assoc. and Capital One, WGMS Public Space Activation Partner, for helping make these art installations possible. Washington Gateway Main Street partnered with artist Julie Ann Otis to present American Therapy. This civic engagement art installation visited Blackstone Square from September 25th through October 1. American Therapy asked the questions, “How can we make social change by letting go of the noise? How do we hold unbiased, compassionate space for others no matter how much we disagree?" 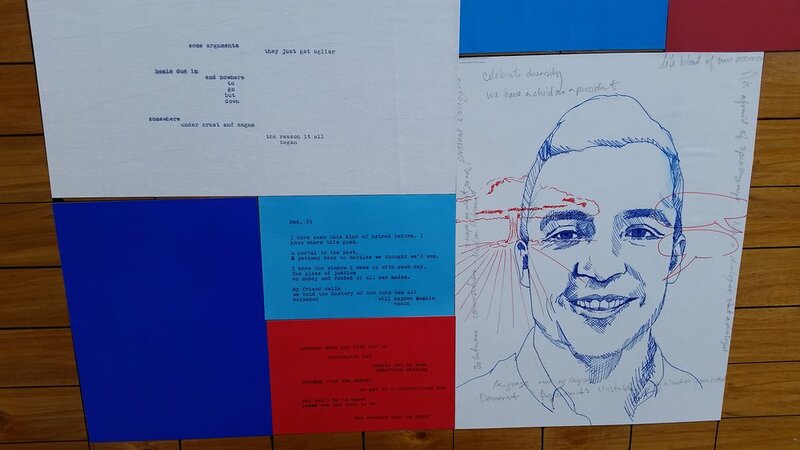 Artists turned participants' American experiences into a mural of poetry and sketches. 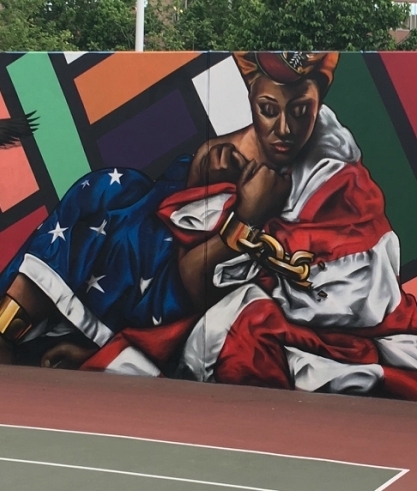 In partnership with well known artists PROBLAK (Founder, Artist for Humanity) and Marka27 (Product Designer, Converse), City Lights Performing Arts School & Mayor Walsh's Boston Art Commission, Washington Gateway Main Street raised funds needed for the new mural on the Peters Park Graffiti Wall. A community crowd funding campaign raised over $12,000. Thank you to all who contributed. 100% of the money raised was used for the implementation of the new mural on this iconic art wall, covering the cost of the artist, required materials and supplies and stipends for youth for their involvement in this project.